Ford is planning for another RS-badged Focus as the current generation Ford Focus RS is preparing to stop production by April 6 this year. 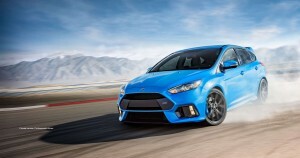 The next-generation Focus RS will reportedly be a hybrid that can produce up to 400 horsepower. Dutch publication Auto International started the rumor last week when it reported that the next-generation Focus RS will have a 48-volt, mild-hybrid system that will boost the power production of the vehicle. That is reason enough for the RS-badged Focus to be able to choke out a nice 400 horsepower output. The current-generation Ford Focus RS produces 350 horsepower, though a 370-horsepower version was also available, thanks to a Mountune performance kit. The 370-horsepower Focus RS was aptly called the Focus RS Heritage Edition. The same report said that the current 2.3-liter turbocharged inline-4 engine will be carried over to the next-generation Focus, but it is believed that the hybrid will have a bigger starter motor that will seriously boost the powertrain capability. Aside from the 400-horsepower output, the new Focus RS will allegedly also come up with an additional 44 pound-feet of torque, bringing the total to 394 pound-feet of torque. These are just rumors, of course, but there’s credence to it since Ford plans to electrify most of its vehicles in the coming years. In fact, it even teased a future battery-electric performance crossover that would carry the “Mach 1” name. There was also a report that a hybrid version of the Mustang and F-150 might be coming out. Jim Farley, executive vice president and president for global markets, earlier said that Ford plans to distribute seven fully-electric cars in North America by 2022. This might be the start of that project. There’s no timeline as to when the next-generation Focus RS will come out. What we do know is that the next hatchback will make its bow at the 2018 Geneva Auto Show. The sedan version might make its debut at the 2018 New York Motor Show. The Bugatti Chiron made its debut last month at the Geneva Auto Show, but it was absent during the 2016 New York Motor Show in late March. Bugatti’s new 1,480-horsepower hypercar will replace the Veyron. Although the Chiron was not present during the NY Auto Show, it wasn’t really far from the action as the same blue example shown in Geneva was spotted parked at the curb in the Big Apple according to Motor Authority. The photo shown was posted on Facebook by a Bugatti Chiron fan. The hypercar’s front trunk was even unlatched. It wasn’t clear why the Chiron was in New York when it didn’t attend the motor show to begin with, but it was more likely there to be privately presented to prospective buyers who flocked in Manhattan for the NYIAS. Chiron has been enjoying massive demand and orders. During the car’s launch in Geneva last month, it claimed a third of the planned 500-unit production. The starting price is at 2.4 million Euros, in case you’re interested. That’s roughly $2.73 million. 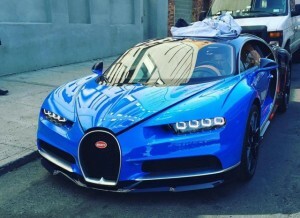 With the price tag, Bugatti said the car is actually making a profit compared with the Veyron, which was rumored to have been selling at a loss. The Chiron has an 8.0-liter W-16 engine with a two-stage turbocharging system. There are four turbos, with two designed to be always on while the two other are electrically actuated when the driver wants more acceleration. That engine churns out 1,500 horsepower and 1,180 pound-feet of torque. It’s more powerful than the Veyron, but the acceleration is just 2.5 seconds to 62 mph. the top speed is 260 mph, but Chiron is aiming for more with a “top speed more” that can be activated by a special key. The company calls the headlights up front an “eight-eye face” with an active wing on the rear for the air brake. It also has 20-inch wheels on front and 21-inche wheels at the rear, as well as eight titanium brake pistons at the front and six at the rear.